This is the month of love! But in my mind, every month should be the month of love. I mean, who doesn’t need a little more love everyday, right?! So for this post I want to share with you something I made for a very special person, whom I happen to love….my husband, Sam. I have been wanting to update some of the pictures in our home, and I will tell you what, we had no problem finding fun pictures of our kids but never really realized how few we have of the two of us together. That is without our heads or arm cutoff in the pic from our mini photographers. Never the less, I happened to come across a picture of us that was nice, and it also came with a wonderful memory of a fun date night together. I decided I wanted to do something special with it….but what??? 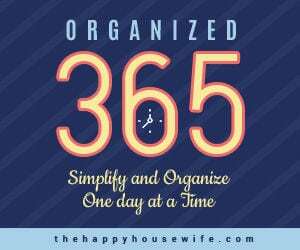 Well, I gathered some things I had in my craft room and around the house and went to town on creating something special. Here is what I came up with. I love how it turned out! 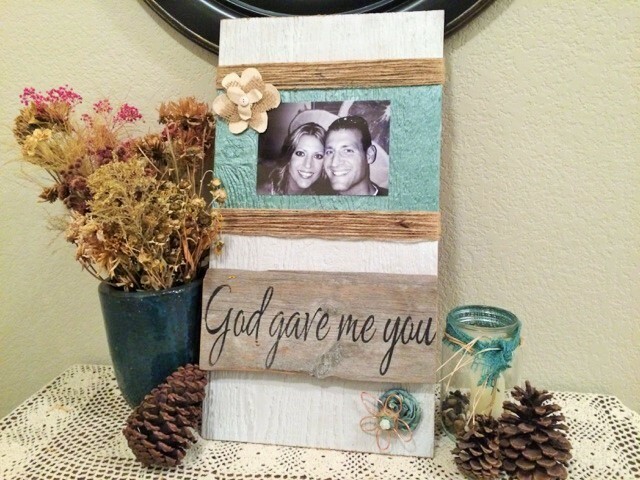 Here’s how you can make this DIY picture decor. Paint for base coat (white) and accent paint (metallic color called Dark Patina) – I love this color! 1. 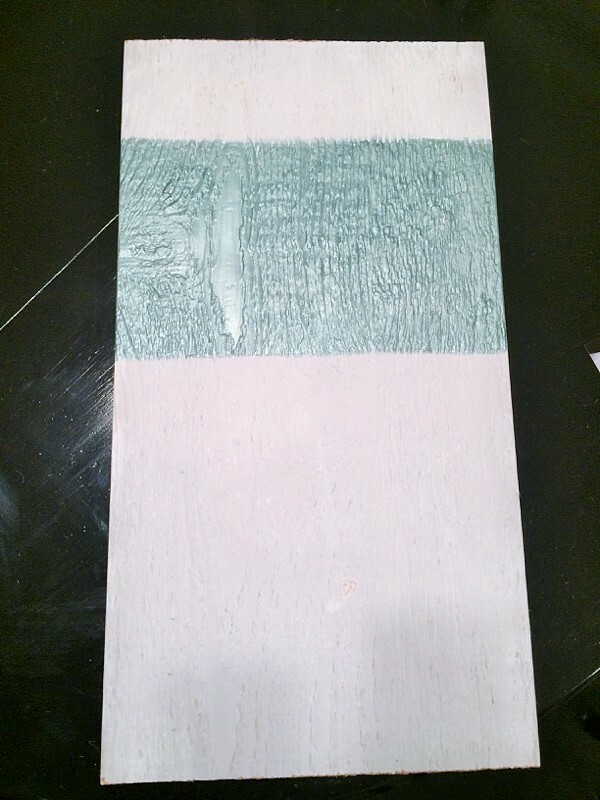 Paint the piece of wood with the white base coat paint. 2. Add your accent color. I added mine about 3 inches from the top and made my color a width of 7 inches (to border my 5 x 7 picture). It does not have to be a perfect line because your line will be covered. 3. 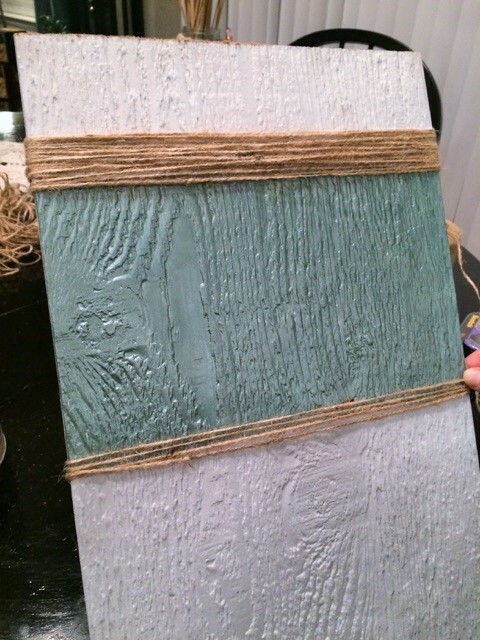 Wrap the jute string around the width of the accent color, top and bottom. To start the wrap, tie a knot at the back of the board and then start wrapping, ending in the back to tie another knot. I made my string width about an inch and a half. 4. Place your picture in the center using the double sided adhesive tape. 5. Make your flower. The best way to cut petals is think about making a tear drop like cut. Just guide your scissors. Bottom Petals – made out of muslin fabric. I made about an inch and a half cut for each petal and I cut 6 petals out. 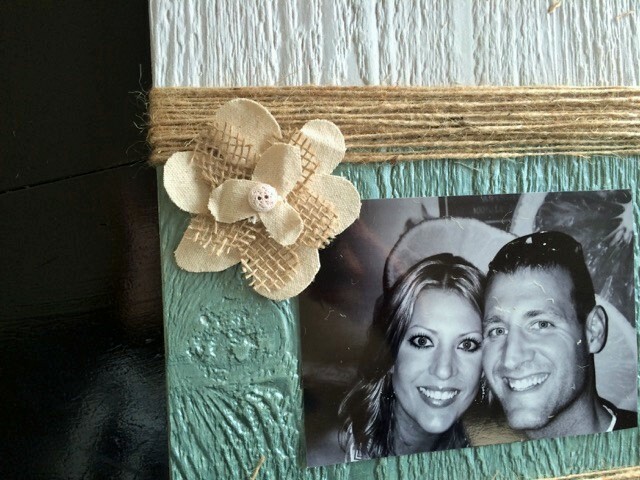 Middle Petals – made out of burlap. I cut them about an inch long and cut out 5 of them. Top Petals – made out of muslin fabric. For these you will cut them about a half inch long and only cut out 3. Arrange your flower how you like it, fitting the petals together nicely (the base of them should overlap, making a nice shape). After you arrange them, start gluing them into place using the hot glue gun. 6. Stencil your saying onto the barn wood. The barn wood I used with the stenciled saying, I had bought from a craft show (Thank you S & K Creations!). I just loved it! The barn wood, the saying, the simplicity…all of it! But you can make your own. 7. 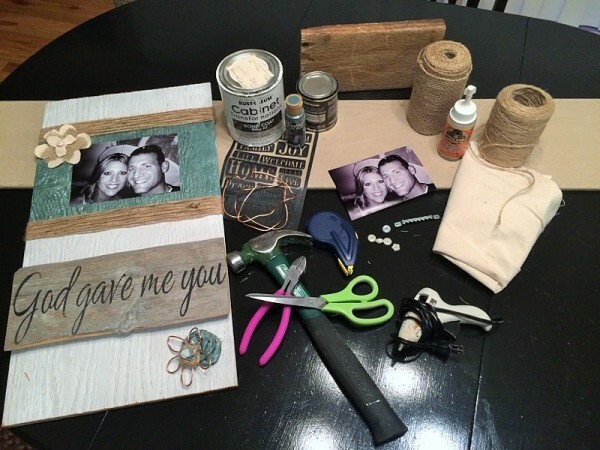 Put some Gorilla Glue on the back of the bard wood and place it onto your picture board. I placed mine about 3 inches below the jute string. 8. Cut a 9 x 2 inch piece of muslin fabric and a tiny piece about a 3 inches long and a quarter inch wide. Lay them out on some paper (or whatever you want to paint on) and paint them with your accent color. 9. 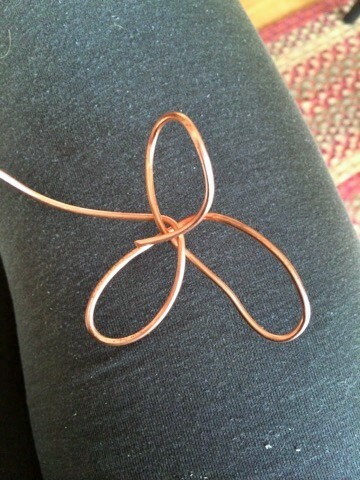 While your muslin fabric is drying, you can make your flower out of copper wire. Form a flower petal with the end of your wire (about an inch and a half). Then twist it to the other side to make the other petal, and so on. I made 5 petals. This can be a little tricky, but just keep working with it, bending your wire and straightening your petals. After you have your flower formed, take the jute string and wrap it in and out until you create the center of the flower. Tie a knot on the back of the flower. 10. 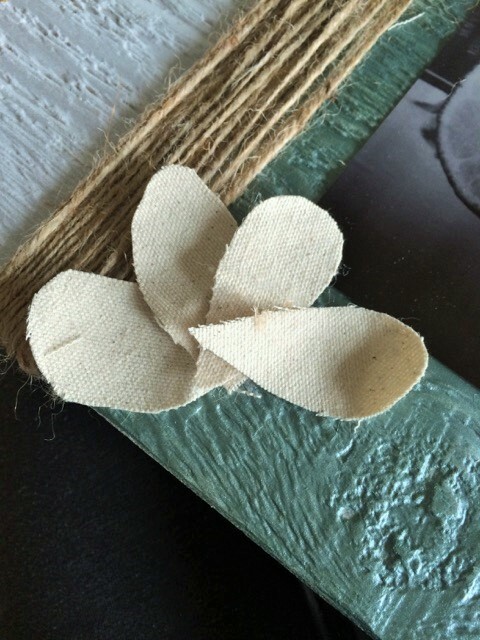 After your muslin fabric has dried, make two flowers. With each piece, twist one of the ends, making a center, and start twisting and wrapping the rest of the fabric around it, gluing the end so it does not unravel. I apologize, I did not get pictures of this. 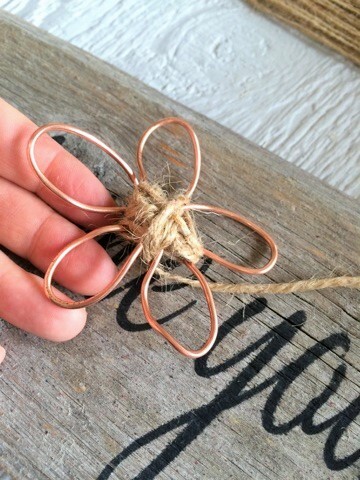 Glue the little painted flower to the center of your jute string wrapped around your copper wire flower. Then add another decorative button to the center of that. Take the two flowers (copper wire & larger muslin flower) and place them how you want on the bottom right corner of your board. Then glue them into place. 11. 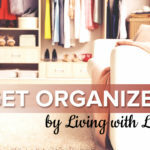 If you want to hang this up, attach the picture frame hanger hardware to the back. And there you go!!! This is one of my favorite pieces I have made. I just love it! Have fun making your own, and remember to spread the LOVE! 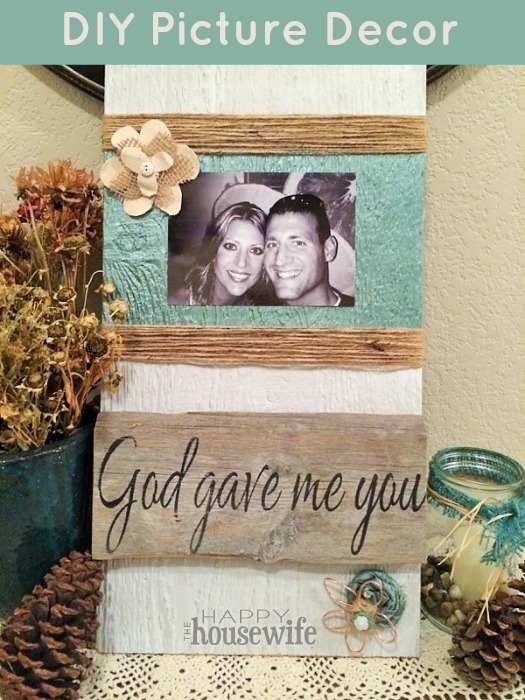 I’m not religious, but this is such a cute DIY project. I absolutely love it! I think I will do something similar with a photo we just took today. The hubby deploys soon, so it will be nice to have a new photo up on the mantle.